Nailart Creations: Stylish Blogger Award! The sweet Cathryn from hot.pink.aurora , the sweet Nina from LiveLifeGorgeous, the sweet Katherine from necessary nails, the sweet brittany from Beauty By Brittany, the sweet Cre8tive Ktina from Nail Art Designs, Tutorials and random information and the sweet Loble from Stuff! 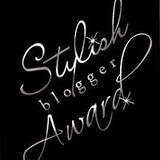 gave me this Stylish Blogger Award! (Check out their blogs too!). 2. I'm a nail polish addict for almost 4 years now! 3. I've got brown hair, but I painted it blond the last 2 years. 4. I love animals! (Except the spiders..) I've a guineypig, rabbit and a cat right now. (And had tons of hamsters, a dog, fish (alright, fishes are a bit boring), 2 other rabbits, 6 other guineypigs (maybe more) when I was younger. 5. I failed my exams last year, so this year I only do 4 subjects to fully complete my Havo exams. 6. I love high heels! 7. I'm living with my older sister and mum for about 10 years now. Thank you Cathryn, Nina, Katherine, Brittany, Cre8tive Ktina and Loble! Hoi Sylvia, allereerst een gelukkig en gezond en veel gelakte nagels in 2011. Nog een fijn 2011 toegewenst! Love this! and love that you posted the links to the others! I love reading new blogs! Heel erg bedankt voor deze award! Ik ga em binnenkort plaatsen ^^ Jij ook nog een gelukkig 2011! Aw, dank je Syl! We zullen even nadenken over wat we over onszelf moeten gaan vertellen, haha.